The Mets needed a strong performance from a starting pitcher, and the got it. Pedro wasn't great but he was pretty damn good allowing three runs in 7 innings and if not for a terrible error by the alleged Gold Glove winner Luis Castillo, it would have been at least one run fewer. The Mets even got two shutout innings out of the bullpen. But as always happens, something goes wrong. 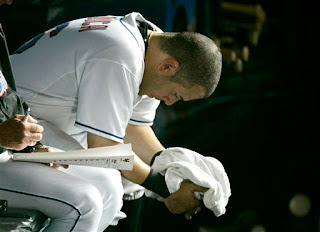 The Mets couldn't get any runs across against Joel Piniero. The Mets took far too many first pitch strikes and allowed Piniero to use his breaking pitches when he got ahead in the count. It's hard to blame an offense that has consistently put up 6 runs a game but every game is crucial and at this point one bad day is likely one too many. Willie needs to wear a fake nose and glasses to shake this team up. The Mets are the modern day Titanic, I love it!